Life is often compared to a journey, whether it is viewed as heading toward a specific goal or as a chance to meet and get to know people and experience new situations capable of changing one’s life. I have to confess that when I was young I seized every opportunity that came my way to make a journey, even just a short one. 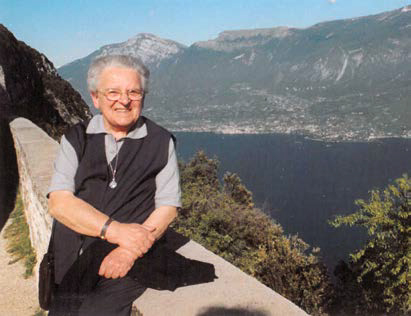 It was because of this that I accepted an invitation to make the trip from Brescia to Alba in March 1950 to participate in a course of spiritual exercises organized by the Daughters of St. Paul, even though I wasn’t very interested in making a retreat. On that occasion I came to know the sisters and they were so different from my mental picture of nuns that they didn’t seem real to me. Smiling and dynamic, they roused my curiosity about their simple and poor lifestyle and also about their life of prayer, which kept them “nailed” to the chapel for a whole hour of adoration every day, not just for an hour once a year, as was true of me when I participated in the “Forty Hours” devotion. These Sisters were full of surprises and I admired them, but the idea of becoming a religious never entered my head, as I candidly told the Sister who was guiding the retreat when she asked me the question directly. But on 19 March, the Feast of St. Joseph, which was also the last day of the spiritual exercises, divine Providence arranged for me to meet a man of God (Fr. Stefano Lamera), who opened my eyes to my future. I realized that this was where the Lord wanted me to be in order to follow the path he had marked out for me. Naturally, not everything was clear to me at that point, but what was clear was the importance of spending my life for the sake of the Gospel. The summer of that Holy Year, the FSPs of Brescia organized a pilgrimage to Rome for young women interested in the religious life and I immediately signed up for the trip. To my great surprise, when we arrived at the Sisters’ residence in Via Antonino Pio, where we would be spending the night, I had a keen feeling of having come home. Consequently, I was happy to begin to get acquainted with the Sisters, little knowing that I would be living with them in the near future. But what made me happiest on my first morning in Rome was the chance to meet Prima Maestra Thecla, about whom I had heard so much. Our encounter, even though brief, surpassed my expectations: from the very start I began to love her and it seemed to me that she looked upon me kindly. [Once I had entered the Institute] I would often run into her when I went to pray in the Queen of Apostles Sanctuary. She would come out the door with her prayer books in her arms, rosary in hand and a shawl around her neck, her expression glowing as she paused to return my greetings. It always made me happy to go down the stairs to the Crypt with her or to find myself in the same pew with her in chapel as we waited to make our confessions. I loved to watch her while she prayed, indeed to surprise her in prayer when she thought she was all alone before her Lord and Master, as happened when she prayed in the small chapel next to her study on the first floor of the Generalate. There were also other, more “official,” meetings with her–primarily the Sunday conferences she guided for the whole community. We [the young ones] would joyfully race to the conference hall, creating a big ruckus with our chattering. But the sound of Prima Maestra’s voice was enough to quiet us down because we were very eager to hear what she had to say. With great simplicity she would introduce us into the climate of the Liturgy of the day, drawing from her heart words inspired by the Gospel and made more eloquent by the wise commentary she offered us. I have to say that some of my certitudes about the Faith were the result of the way she explained these texts even before I had read them. Over the years, I had many chances to encounter Prima Maestra due to the context in which I lived and worked. Maestra Assunta, a general councilor and the head of the Institute’s Central Apostolic Offices, encouraged these meetings between the young Sisters and M. Thecla so that we would have the chance to become better acquainted with her and get to know her feelings about the apostolate. I had the opportunity to approach Prima Maestra a number of times about various initiatives and ask her advice or approval about different projects. She always welcomed me warmly, listened to what I had to say and did not delay in giving me an answer. More than once, before saying goodbye, she would offer me a recommendation that was almost like a plea, namely: that the Central Office [for the Apostolate] in which I worked would always aim at impartiality, that is: that Raggio [the official FSP bulletin on our apostolic initiatives] would take to heart all the sectors of the apostolate, so as to not only provide the Sisters with information [about the Institute’s activities] but to also promote diffusion. I sensed that she was concerned about anything that would prevent her daughters from being one in mind and heart, in life and in the apostolate. Prima Maestra was enraptured by the thought of heaven because everything in her yearned toward holiness. Perhaps she asked herself what more she could do for her daughters to ensure that not even one of them would be missing at the final “roll call.” And the answer was yes, there was one more thing she could do: offer her life for their sanctification. She did this on 28 May 1961, the Feast of the Blessed Trinity. I have no doubt that her self-offering was pleasing to the Lord because just a few months later she began to show signs of deteriorating health that grew more and more alarming. With great worry, Primo Maestro closely monitored the course of her illness during what turned out to be her last period of hospitalization. We younger sisters had the chance to visit Prima Maestra two days before her death. In vain, our eyes anxiously scanned her face in the hope that she would recognize us and then our eyes dropped to her hands, clasped in prayer. With her characteristic dignity, our Mother was poised on the brink of eternity. In fact on 5 February, the feast of St. Agatha, virgin and martyr, our beloved M. Thecla exhaled her last breath. Chronicles of the times provide us with a wealth of information about her solemn funeral rites and also include testimonies that speak about the heroic way in which she lived the virtues…. Very significant is the profile of Prima Maestra sketched out by Primo Maestro, the man of God who had known young Teresa Merlo better than anyone else and had launched her on the mission God had planned for her. Fr. Alberione alone could reveal to us the secrets of Thecla’s life: humility and faith–her path to holiness–and point them out to us so that we might follow in her footsteps. 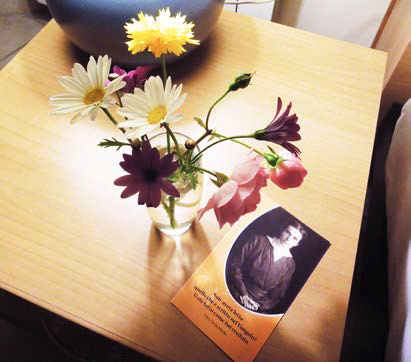 During the days preceding her funeral, not only did I personally participate in the events taking place but they were deeply engraved on my heart as I lived the painful experience of the loss of the person whom I considered to be my spiritual Mother. 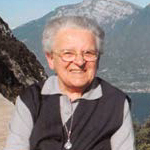 In harmony with the last article of our Constitutions, “let us pray for one another so that the Father who has begun this work of sanctification in us will see that it is finished when the day of Christ Jesus comes.” This is the best way we can make a contribution to obtaining the official recognition of Maestra Thecla’s holiness and hasten the time of her glorification.